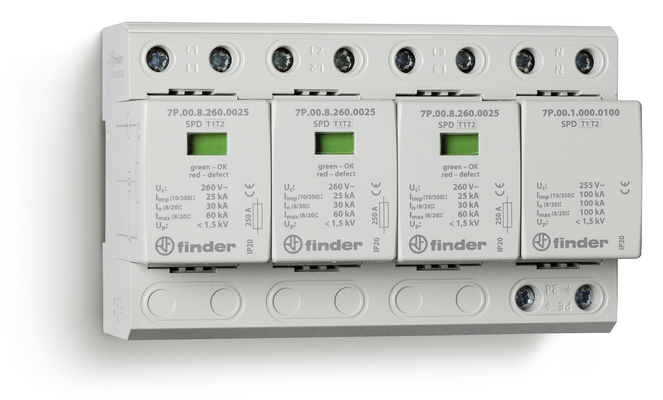 Surge protection devices of the 7P series from Finder are modular in design. The devices can be installed upside down, which contributes to reduction of the cable lengths. In addition to the effects of lightning strikes, over-voltages can occur in industrial applications and communication systems due to the use of power electronics and this can damage or destroy more sensitive electronic components. Protection is essential in order not to interrupt production and communication. Normally, surge protection devices are used for this purpose, such as those offered by Finder - a specialist for components in control and system construction. In order to avoid damage caused by surges, or at least minimise their risks, a tiered protection strategy is required, as specified in the lightning and surge protection standard DIN EN 62305. This standard defines different zones (LPZ 0 to LPZ 3), in which sometimes different protective mechanisms are effective. The protective effects of the various zones build on each other by lowering the energy level of the surge pulse to the point where the protective device of the next stage is not overloaded. The aim is to reduce the remaining over-voltage to below the level which the connected devices of the respective stage can withstand, without suffering any damage. In the LPZ 0 zone external to the building, the lightning conductor has been the central component ever since the 18th century. 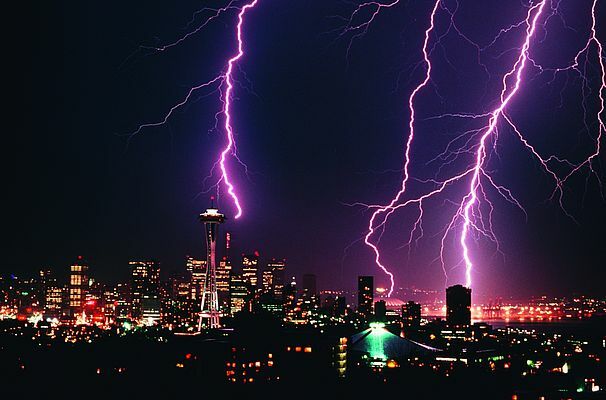 Although a lightning conductor will discharge much of the lightning energy to earth, there remains a significant charge that can enter the building´s electrical installation through the overhead network or underground supply cables. Surge protection devices are also required within the building. Other justification for the need of over-voltage protection within the building includes, on the one hand, high-energy switching operations which itself creates over-voltage, and on the other hand, electronic devices in control and regulation equipment with a low immunity to voltage peaks. Over-voltage protection devices, such as those of the 7P series from Finder, usually consist of a combination of varistors and gas discharge tubes. A varistor is a voltage-dependent resistor, which in most cases is composed of zinc oxide. Its resistance falls abruptly on reaching the threshold voltage, so that the over-voltage can be dissipated. However, as a result of frequent minor over-voltage the varistor will age over time, and must then be replaced. An over-voltage protection element based on a different operating principle is the gas discharge tube. Here, a gas discharge is ignited when a spark gap threshold voltage is reached. In contrast to varistors, such gas discharge tubes react somewhat more slowly. They can however dissipate over-voltage pulses of higher energy levels. Surge arrester or surge protection devices (SPD) are divided into several types. SPD Type 1 is used at the interface between Zone LPZ 0 and LPZ 1, i.e. usually the point where the power supply enters the building. Over-voltage protection devices of Type 2 are installed within Zone LPZ 1, and so form Zone LPZ 2. Additional SPD's of Type 3 are used directly for protection of the device itself, if this has a low over-voltage capability. There are also SPD's of Type 1+2, which fulfil the requirements of both Type 1 and Type 2. The SPD to be selected, and the arrangement and number of SPD's within a network depend on the respective distances between SPD´s, and can differ particularly in the case of TN- and TT- networks. The required arrangements concerning a residual-current device (RCD) must also be observed. The relay manufacturer Finder offers a comprehensive range of surge protection devices. SPD Type 1, SPD Type 1+2, SPD Type 2 and SPD Type 3 are all available within the 7P product range. All devices comply with the requirements of the lightning protection standard DIN EN 62305. They employ varistors, spark gaps or a combination of the two, depending on the type. Devices of the 7P series are modular in design. The basic device with the connection equipment can easily be supplemented with a varistor or spark gap module. If a module needs replacing, it can simply be disconnected and replaced without the use of tools. To prevent replacement with an incorrect module, a mechanical coding ensures that only the right type of module can be connected. The devices are suitable for snapping onto a standard top-hat rail in the switch cabinet. The devices of Type 1+2 can also be installed upside down, which is particularly advantageous in achieving the shortest possible cable lengths. A defective varistor is indicated by a coloured window on the front side of the device, and a signalling contact is also fitted, allowing the condition of the varistor to be monitored by a supervisory system. Through the correct use of over-voltage protection devices in electrical installations, machines and systems, the risk of damage to sensitive electronic assemblies by over-voltage can be minimised. With the over-voltage protection devices of the 7P series from Finder, the user has a comprehensive range at his disposal, ensuring effective protection against over-voltage.